I am on light duties for a couple of weeks so the light weather on Wednesday night was just what the doctor ordered. For most of the night I occupied the back corner with Elaine and we shared the back stay duty. From the stern I could get a very good view of the mainsail and played the back stay on and off according to the strength of the breeze. After eight months of sailing Passion X I was still surprised at how responsive the mainsail is to back stay tension and Ron was able to leave the mainsheet in the one position for much of the windward works. In the light conditions we drifted out of Humbug with the fleet closely packed. Dump Truck had her nose in front at the exit and was first to the breeze. 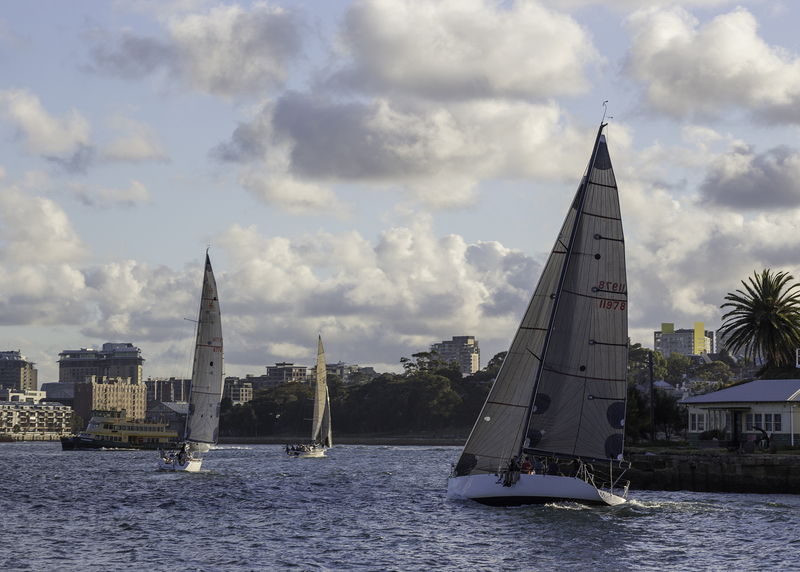 Soundtrack had edged ahead to leeward and also took off early so there was a good crowd going down the side of Cockatoo Island. From recall we had Flashback to Leeward on starboard and Soundtrack in front when a competitor pushed through inside alongside the continuous obstruction and then wanted room to not hit Soundtrack. We could have argued all night but rule 14 says avoid a collision and I was in no mood for a protest hearing so I told the crew to let it go. My reading of all the discussion on continuous obstructions is that the yacht passing inside must have a clear path and that includes all other yachts ahead which are obstructions. If the passing yacht is naturally faster and has a following wind that blankets the clear ahead yacht then there is no way they should go inside. 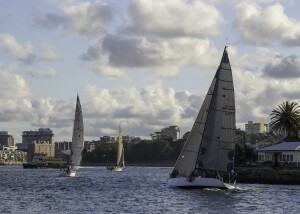 If they want to be there they have to win the race to the corner of Cockatoo Island. Irukandji was having a good night and threatening to go inside around the end of the island so we pinched up into the dirty air of Soundtrack and which was not the fastest place to be. 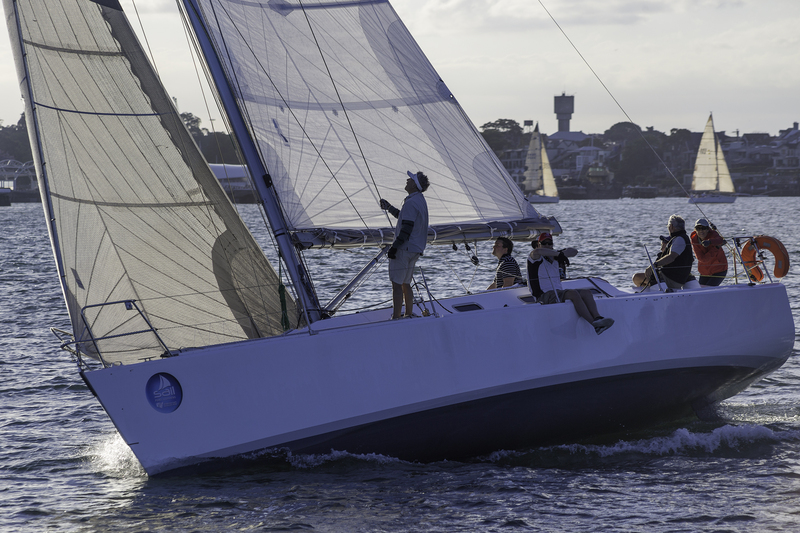 Soundtrack and Jackpot ahead drew away while we had an absorbing tussle with Irukandji and Flashback all the way to the finish line. 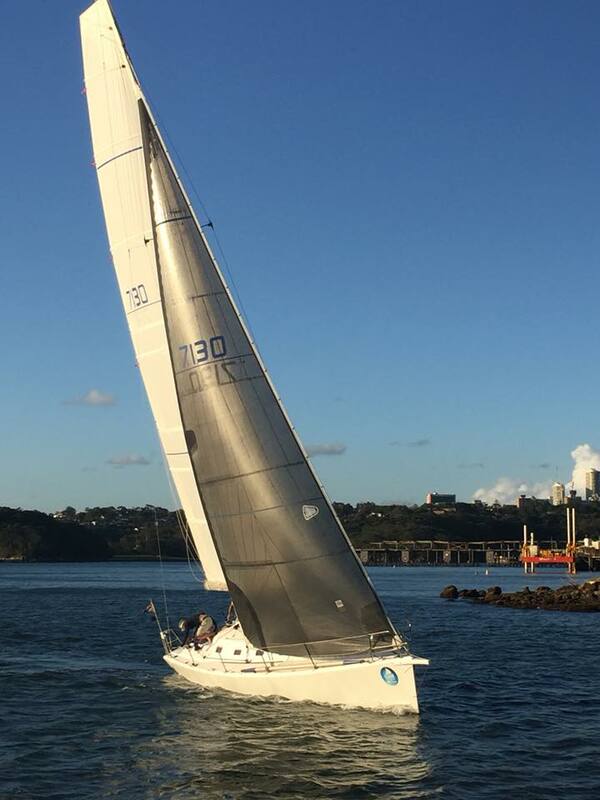 Flashback made a huge gain alongside the Greenwich shore while we lost out on the Balmain shore but with all the wins and losses we came together at the navigation mark off Goat Island with Flashback streaming in on starboard. 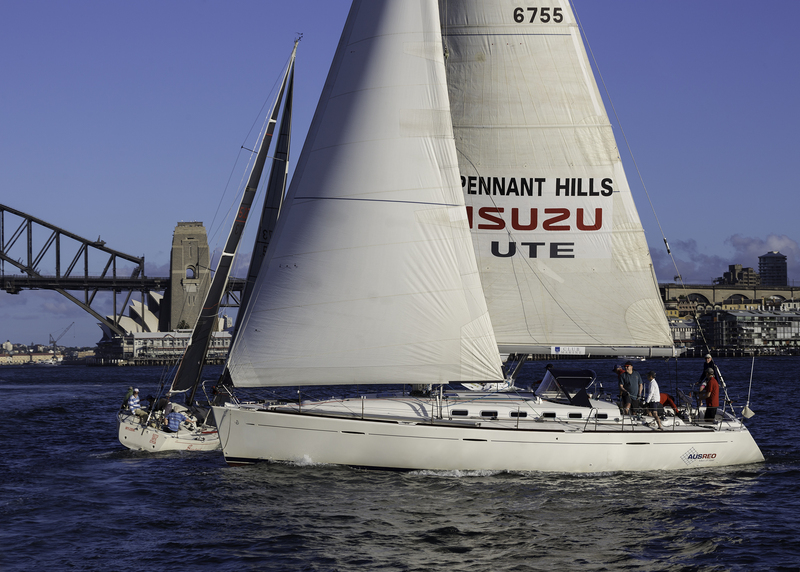 It did not help our case that Irukandji had just tacked onto port above and overlapped so that we had no where to go to other than take Flashback’s stern below the navigation mark. Perhaps it was the outgoing tide or the lift off the sails of Flashback but just as we tried to tack we lifted to the mark and scraped around it with inches to spare. Once we regained our composure it was time to chase Flashback down and try to stay in front of Irukandji. 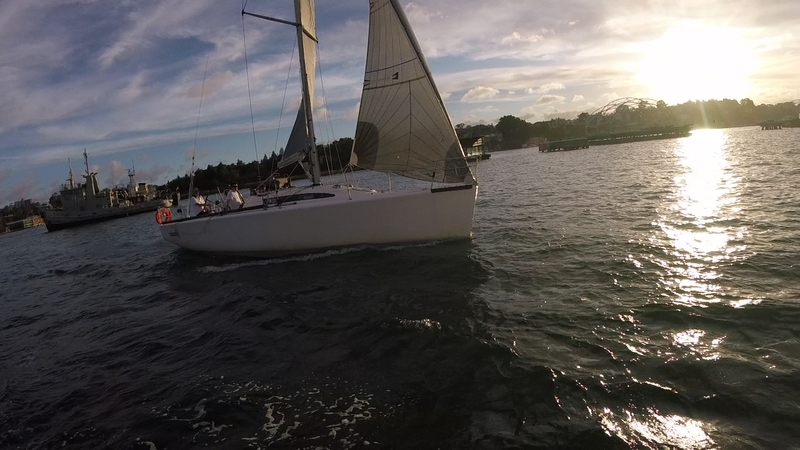 From my perch at the back of Passion X I aimed the Gopro camera at Irukandji and ordered her to stay behind. I aimed it at Flashback and noted her sweet sail settings and tried to emulate them on Passion X to a degree of success. We made a little break on Irukandji which lasted to home and soon ran down Soundtrack. The fleet ahead of Jackpot, Dump Truck and Much Ado V were becalmed in Humbug and we hoped for another miracle by hugging the Onion Point shore. Flashback ahead had to tack away from the shore while we lifted further along and were able to tack back ahead. (Thank you wind gods) From behind Irukandji also caught Flashback to add to the insult. Our fourth across the line was a little undeserved but as always we take what crumbs we can. Talking about crumbs the series wrapped up tonight and we were 4th fastest over the spring. There was a tight race between Jackpot, Flashback and Passion X and to be fair Dump Truck might have won had the paper work been in order but as I said we take what crumbs we can. For those with deep pockets who want to race at the front of the Greenwich Flying Squadron Black fleet on the Wednesday night social race they can do little better than look at the Ker 40+ Invictus that is now up for sale at GB Pounds 575.000.00. Google translates that to AUD 1,006,700 but you might be able to haggle the seller down to under a million as you will need another $25 grand to get it to Aus. My guess is that it will rate 1.3 and do well in the super 12 regatta at Port Stephens if they go there again. Our Passion X rates around the 1.1 for which I am very crooked on the handicappers but be that as it is, it cost around AUD200,000.00 For five times the cost we could go 18% faster. My quick calculation is that this is A$44.000 per percent of boat speed. Since Invictus was launched she has has a foam filled bow added and a keel modification and the designer has more go fast ideas in mind. We all want to go faster and on Sunday at Middle Harbour Yacht Club I had a look at Show Time a 2011 Ker 40 that rates 1.2. Since launch, from the ORC rating certificates, it appears she has shed half a tonne of weight and grown a deeper keel. Also the mainsail has gone up 5 m2 and all this has increased the rating from 1.13 to 1.2. 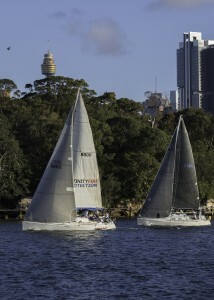 Regardless of results they seem happy sailing in the Super twelve fleet. There is a demo MC 38 for sale at A$375,000 and that rates around 1.2. The draft at 2.8 metres would also be an issue but in terms of bang for buck it would seem cheaper speed than Invictus. On a dollar per percent increase in speed (compared to Passion X) it is a more realistic $19444.00. Now there are practical limits to keel depth if you want to finish the GFS Twilight race without running aground. We draw 2.45 metres and have already touched the soft muddy bottom up the Lane Cove River and we are nervous sailing the Drummoyne shore. On the plus side we have 600 litres of water storage if we want to fill it up. hot and cold running water with inside and transom showers and a big powerful fridge to get the beer cold during the twilight race. 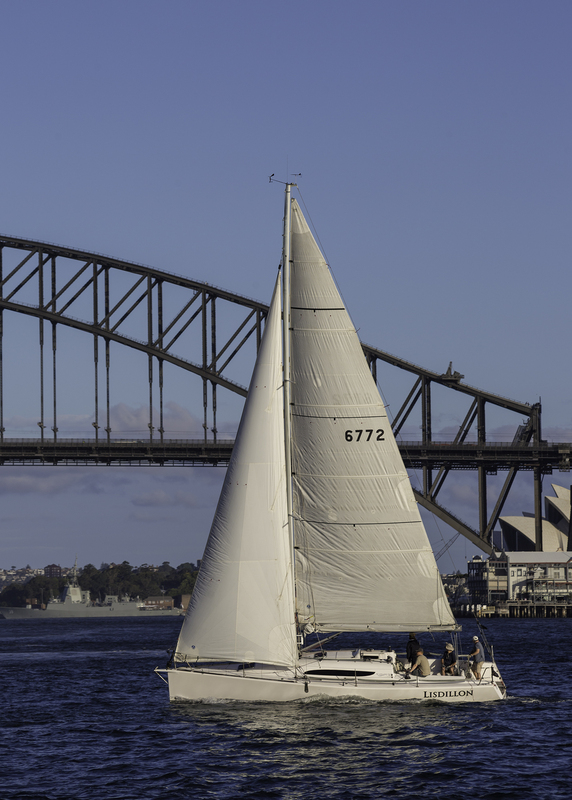 With that in mind it must be time to take Passion X up to Pittwater relaxing along the way as the autopilot looks after the steering. This post is both pre and post op. The post op is from a fibre reinforced David who is feeling pretty well. Last night we improved on our previous race and finished fifth fastest. The fresher than expected breeze faded at the end of the race stringing the fleet out a little more and favouring the front runners for handicap places. Dump truck gave the fleet another lesson but this time it was mainly in how to sail fast so it was Dump Truck then daylight followed by a fast improving Jackpot. Flashback with a new genoa just held out Much Ado V and we followed across the line. 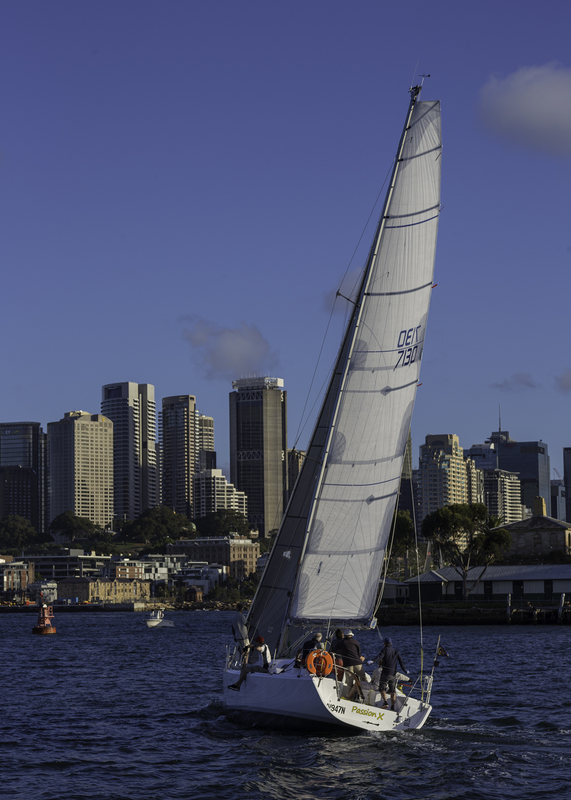 With the light winds forecast the course setters sent us out around Cockatoo Island then to Goat Island and home. 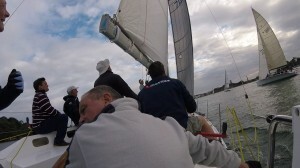 The breeze freshened at the start and stayed around 12 to 15 knots for almost the whole hour of the race. 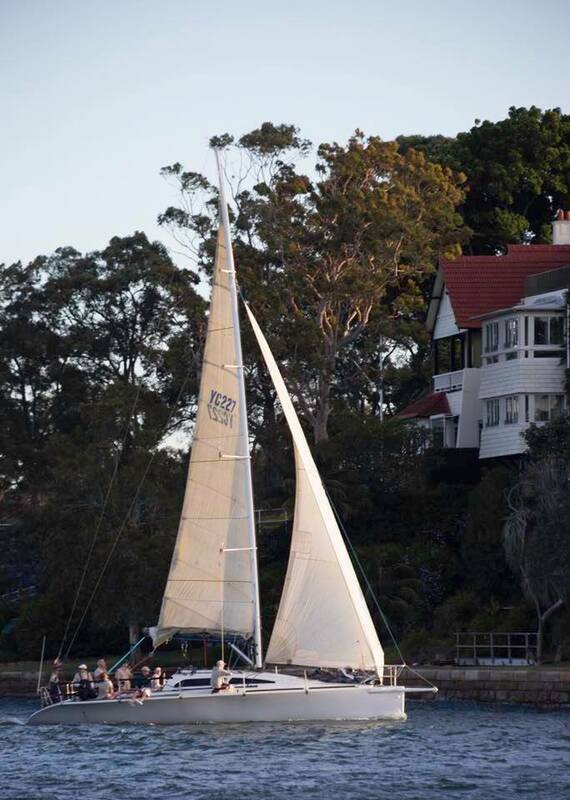 In anticipation of sub 10 knots we set the 140% genoa and a full main which served us well on the reach out of Humbug and run around Cockatoo Island. Once on the work to Goat Island Dump Truck and Flashback, who were ahead, drew away and Jackpot overtook us along Cockatoo Island. Much Ado V caught us by Long Nose and Ausreo was right on our stern. A combination of our dirty air and lightening winds allowed us to hold out Ausreo until we could reach away at an angle more favoured to Passion X. So I think we need to work really hard and we will find a solution. 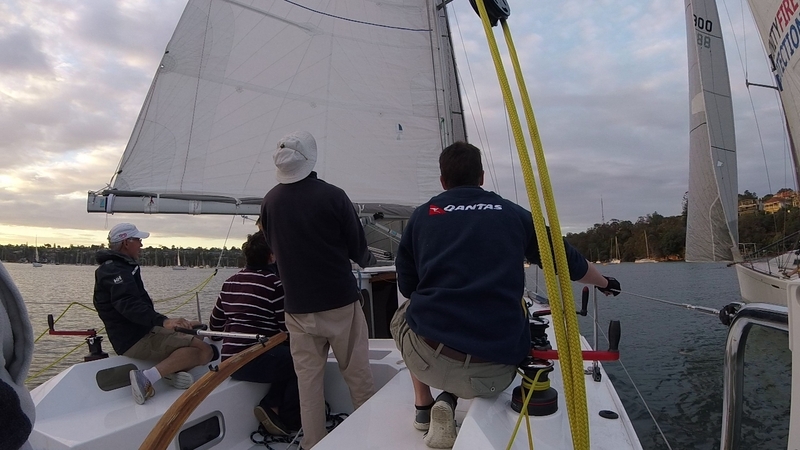 I would like last week’s race over again with the No 4 jib and the main reefed and I would like last night’s race again with the No 3 jib and the full main. But considering what we had up I think we sailed pretty well by adjusting the rig for the up and down conditions and we will improve with more time on the water. So our little pre race bottom touch in the soft mud could have been worse. Overnight some good photos came in courtesy of Peter Miller. I have a many small tasks to complete on Passion X before she will be fully finished and today I tackled a few that needed some epoxy undercoat. I had already made up intricate backing pieces for the bolts holding the bowsprit. These had been shaped and painted and now needed to be epoxied inside the anchor locker and finished off with a final coat of epoxy. An extra coat of epoxy was added inside the bolt holes to lock out the water. As I worked away in the confined space of the anchor locker I noticed the area where the latch was fitted was unpainted so it received a coat of clear epoxy and a couple of coats of white epoxy wet on wet to seal the edge of the plywood. This is a really strong area of the boat as I put a 12 mm ply doubler on the hull side to carry the load of the bowsprit and two 12 mm ply doublers on the deck side to compensate for the hole in the deck for the lid of the locker. It is no coincidence that it looks like a J122 anchor locker including a matching latch. The surplus epoxy primer/undercoat was used for a few tiny touch up jobs and to coat a section of backing ply inside the vanity in the head. It has been unpainted since March but the head is so dry that the piece of ply was as new. Now it has a couple of wet on wet coats of white epoxy to protect it. When we first launched we were getting a little salt water into the head. After a bit of investigation the source was found to be the outlet for the sink. Passion X is a light boat and heels to 30 degrees in a breeze. At that angle and with wave action some sea water was pulsing up the drain. When racing I now turn the outlet valve off and that has solved the problem. An alternative would be to put a right angle outlet on the sink and lead the hose towards the centre of the yacht but the extra distance is quite small and I suspect water would still pulse up the pipe in a big seaway. The tiller was manufactured the day the yacht was lifted out of the back yard and with not a lot of spare time before launch it received just two coats of clear epoxy. I sanded it back and gave it another coat today but the rain came before the coat was fully cured so it might be a rinse and repeat task for later in the year. We have modified the angle of the tiller from the plan by gluing a hardwood wedge to the underside where it fits into the stainless steel head. This lifts the tiller and gives more clearance for the knees of the crew. Following up from yesterdays disappointing race I re positioned the first reef line so that it is fixed to the boom behind the slug on the boom bag. We will now be able to flatten the foot more when we have the reef in the main. Both the first and second reefs come to the boom next to boom bag slugs and I will have both moved soon to give a bit more room to adjust the foot depth when we are reefed. I am annoyed with myself for not fixing this issue sooner. Almost as annoyed as setting the No 3 jib last night instead of the No 4. Very briefly we were shown on the Greenwich Flying Squadron results as leading the fastest times point score for the Spring series but after the pride there is always the fall and tonight there were seven in front and three behind. On reflection the wind was similar to race three when we were third fastest so what was different? At the front end of the fleet tonight the crews of the Ker 11.3 twins,Much Ado V and Dump truck, put in a very impressive performance. To windward they were particularly strong. Both yacht carried what I would call a No 4 jib and a reefed main and on the course they had the mains out wide in the gusts. 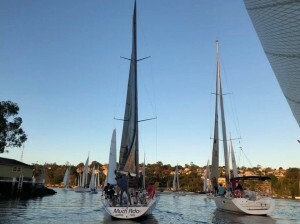 Flashback had a very large crew on board and at the presentation skipper Brian paid tribute to the crew doing two headsail changes out on the course. The live ballast on the rail from the fifteen crew would also have helped in the heavy conditions. Jackpot had their temporary secret weapon on board manning the mainsail ably assisted by a young strong winch man winding it back on. They had similar issues to Passion X and like Passion X they moved their jib cars back and played the main very aggressively. Unlike Passion X they had enough power to handle the conditions. 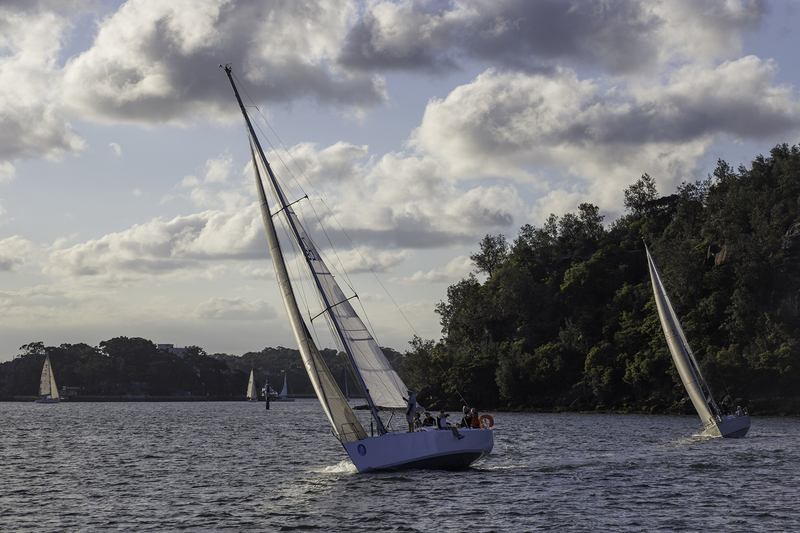 On the work to Goat Island, Soundtrack picked up a left shift above Passion X and lifted well above us and were never seen again until the race ended. We had a good tussle with Lisdillon who likes a bit of breeze and was handling the breeze better with a full mainsail than Passion X was with a reef in the main. Ausreo is a big powerful beast and once she wound up she slowly caught Passion X. She went inside us at Onion Point on the way home and then called for room to tack. There was not room to go through the obstruction so she should not have been there but once she was inside us the only polite thing to do was to give them room to tack. Another place lost on the way to the line was a bit of a dampener on an already disappointing evening. 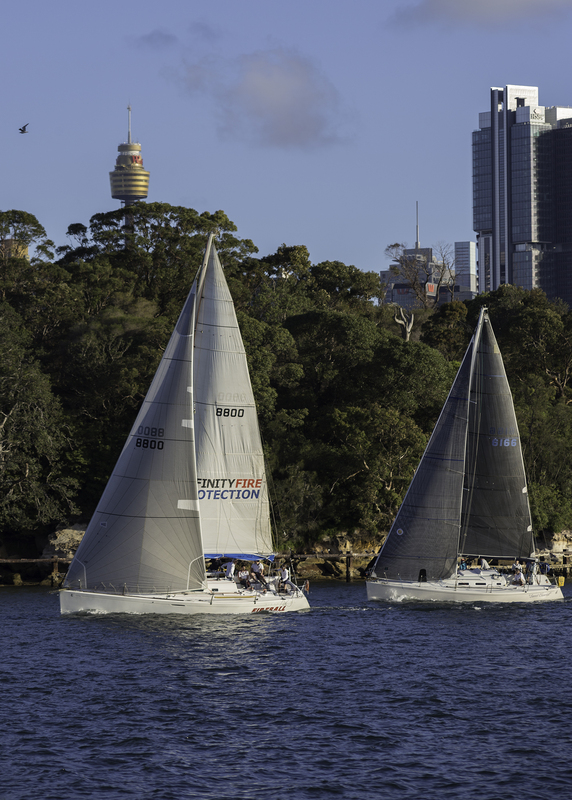 We did hold out Fireball, Irukandji and Sweet Chariot but only by a short distance and only after strong performances by these three on the beat to Goat Island. We did much better in race three with the No 4 jib and the reefed main. In that race we took the reef out and lost a place to Lisdillon but possibly saved a place on Flashback. Tonight Flashback was so far in front of Passion X we could not do worse than to revert to the No 4 jib for the beat and take the reef in the main out for the run back to Cockatoo Island. With the reef in the main we could not pull the foot out as flat as I would like because the reef line was in front of a slug on the boom bag. It seems a small issue but the fullness in the main cancelled some of the benefit of the reef. We rounded up a lot tonight which is the first time we have experienced this as a persistent and troublesome issue. I was encouraged be Steven Bradley’s observations on the performance of Jackpot in the same conditions and that was the main needed to be dumped aggressively and wound back in just as strongly. As well as move the jib cars back they did tension the jib halyard and that was one area we could have given some attention to. Above all I think we had too much sail area for the first three quarters of the race and had we had the No 4 jib up we might have taken out the reef for the last run through Humbug. Jackpot on the way back to the finish with no reef in the main. For our part the order of the title for this post was reversed as the wind taketh away on the way out of Humbug but giveth back in plenty on the work to Goat Island. To be fair, it was probably not fair as the win back was massive compared to the loss but then it felt good to be lucky. Some of us had a long day as we took our sail maker out for a review of the rig just after noon and enjoyed a couple of hours of test sailing in 12 knots. The conditions were ideal for a test sail and I will share all the advice we received. 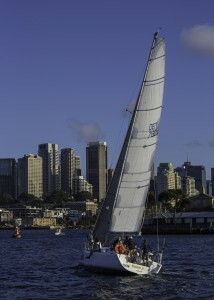 Number 1 was to keep the vang on to windward as we do not have a mainsheet traveller. He observed our mid leech was laying off before the head so that was easily fixed. Number 2 will be harder to implement as he suggested a couple of gorillas on the mainsheet. One for letting off and one for pulling back on. Now non of our crew are young enough to be described as gorillas but we will try our best. Number 3 was a small increase in mast rake to increase the windward helm. I am not sure about this last one as we are pretty well behaved and I don’t want to round up more in the gusts so we will see how the vang sheeting goes for a few weeks. In the race proper we started on time if a bit low on the line. We made good progress to Onion Point but again got buried in Humbug with the fleet behind. As the course was to leave Cockatoo to starboard we went low only to be headed on what is normally a broad reach into the corner of the island. All the fleet except Flashback and Lisdillon charged off from further to windward leaving us close to the back of the fleet. Around Cockatoo Lisdillon came with following wind threatening to go inside at the point and we could not have that. (You do understand Andrew) As soon as we could I headed away from the wind shadow of Cockatoo into clear air. Now this is where the wind giveth back as we had pressure and angle to burn hitting our target speeds of 7.1 knots SOG on more than one occasion. The tide was flowing out at this time and being mid stream did help with the boat speed but it felt good to be catching the fleet quite quickly. By Goat Island only Jackpot and Dump Truck were ahead and we were pleased to be sandwiched between the Ker 11.3 twins. Flashback loomed up around Goat and went East from the gap while we went deep and benefited from breeze through the gap. 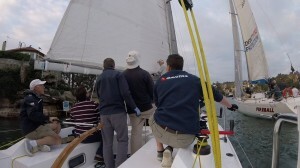 As good as the breeze from behind was we could not make an impression on Jackpot and their secret supplementary crew. Over our shoulder Much Ado V was menacing and drew alongside at the turn into Humbug. Here our master strategist, Kevin, insisted on a run deep to the shore and a risky beat alongside the moored yachts. By sheer luck we managed the corner at Onion Point having skirted the becalmed fleets in mid stream still battling the outgoing tide. At this point a nose in front of Much Ado V stretched out to a minute 23 seconds which hardly seems fair but we will take it all the same. Flashback was just another 20 seconds behind. Out in front was Dump Truck a full four and a half minutes ahead and Jackpot over one and a half minutes in front of us so the closest battle of the evening was for third to fifth fastest. Lisdillon and Sweet Chariot were just a minute behind this group and rightfully claimed third and first place on handicap. Now Christian Beck on Dump Truck was back on board after last Wednesday winning the EY Entrepreneur of the Year Award and could clearly do no wrong this week. The green hulled mean machine picked all the shifts out of Humbug and was so far up the beat to Goat that our big wind shift made little impact. Indeed we were still lifting towards Long Nose on starboard when they hooked into the next lift on port heading into Snails Bay looking like a winner. Perhaps they have the gorillas on the mainsheet that we need. I had a lot of trouble finding a clear air lane last night and it shows in the results. Dump Truck had a crew of professionals on board at that stopped us getting a clear start. We were low on the line and a header made it tight to clear Onion Point so with a mixture of dirty air and pinching we were mid fleet into Humbug. We drifted past Flashback but they and Fireball hugged the shore out of the tide and took the long way but fast way out of Humbug. Sweet Chariot was giving us heaps of dirty air and I made the mistake of trying to lift into the breeze off Greenwich Point which never came. Fireball cleared out to leeward and Flashback climbed out from under us giving us another dose of dirty air. We has already caught the early fleets and that made finding a clear lane doubly difficult especially when they ignored us when we were on starboard tack and then called starboard on us when we were on port and possible clearing. So we spent the work dipping port tackers and dipping starboard tackers or tacking under starboard tackers. Some of the dips were three yacht deep so long detours. 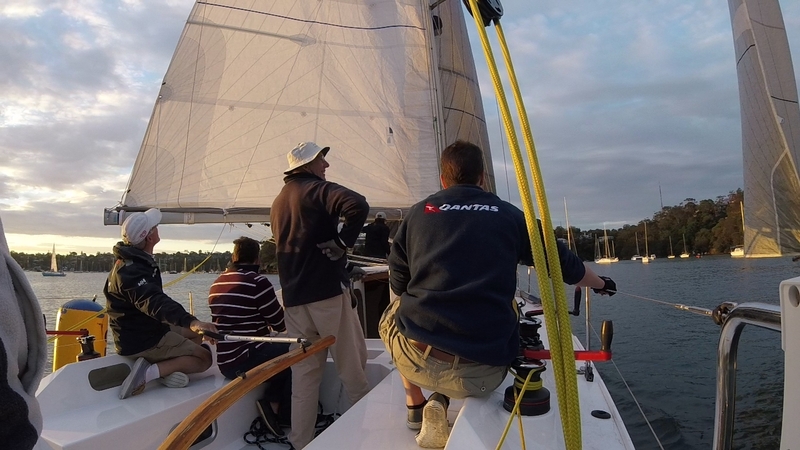 Now I had the GoPro running for the whole race and can see the ironic grin on my face as we tack away from starboard tackers we had dipped while they were on port. In this toing and froing we lost track of Much Ado V, Dump Truck and Flashback. Around Goat we had a slow run as the broad reach in pressure turned into a tight beat in fading breeze and post race Flashback’s skipper tells me they had a good run around the island. 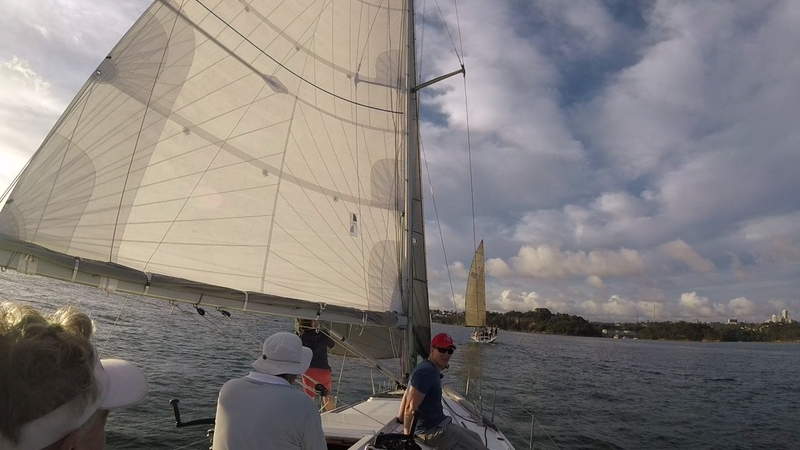 We did better on the run home catching Sweet Chariot in Snails Bay and setting our sights on Fireball. 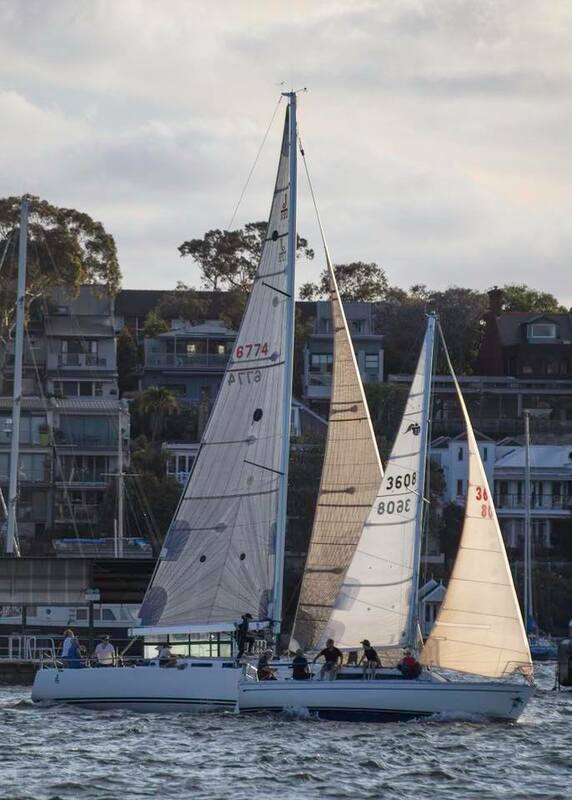 Now Fireball did everything they could to stop us passing to leeward and it was touch and go as we went to leeward on the way to the finish line. We seemed to put our nose in front only to have Fireball charge back with wind to windward. At the last minute we nosed ahead by a second to rescue some credibility on the night.